Hi guys, looking for advice on whether or not I should consider moving the rudder of my C20 outboard and building an outboard well where the rudder used to be as I'm concerned/don't like the interference between the rudder and the outboard where its currently mounted on the bracket. Do you think moving the rudder would negatively affect performance? Thanks. Adam, sounds like quite an undertaking....by the way....I am in Kenosha...Howdy Neighbor!!! I would say, what do you like best motor boats or sail boats. I like sail boats, you have the best 20 foot sailboat there is, more fun than my 26. I'm thinking its probably a bad idea, but i don't like the interference with the engine and rudder. Probably what I should do is just move the engine bracket to one side and or get a prop guard. 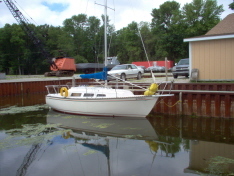 I've got the boat pretty much stripped of all deck fittings and will gut interior in the spring hopefully. Does anyone have any suggestions of how to make the rudder tube/thruhull stronger? I have a yamaha 6hp stroke 20inch shaft. Do you think that will work? What kind of roller furler do you use? I was looking at a cdi ff1? 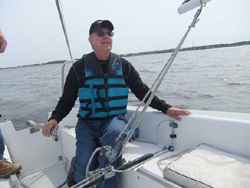 I have had both the C20 and C22 boats and can testify to there sailing ability. They are both great boats. The C20 is more closely related to the C26 than the C22 in hull and swing keel design. One thing I did to help out the interference problem was to move the up-stop for the rudder about an inch and a half aft, very easy, and still allows the rudder to rise to about the same level as the keel in the full up position. If you decide to go the same route make sure the dimentions work for your boat as I'm nearly postive no two boats are the same. As for your 6hp, It should get you buy for a while. I used a 5hp with a 20" foot on my boat and it worked ok. It moved the boat very nicely but, as the previous post pointed out, while the boat hobby horse's the shorter shaft will cavitate some. You could move the mount lower (some of them have multipal mounting holes) but, you run the risk of putting the powerhead under water in extream conditions, so watch out for getting too low. Also, remember as the boat speed rises under power the transom of the boat will settle into the water some, putting the powerhead closer to the waterline. I guess what I'm saying is the extra longshaft would be better. I went to an extra longshaft on my C22 and never regretted it. It's too bad we live so far apart, because I still have a really sweet Merc. 7.5 extra long shaft I had on my C22 that I'd put on you right. Keep in mind that if you are like anything close to the rest of us your current boat is but a stepping stone on your way to "bigger and better" , however you define it so, I'd keep the major mods that require a sawsall and gallons of resin to a minimum. Hate to be so long winded but, that's my two cents worth. Good luck with the new boat. Last edited by Jmckamey on Thu Jan 12, 2012 4:48 pm, edited 1 time in total. 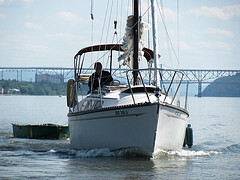 On my 26 if the rudder is down all the way there is no interference at all and if you are sailing and the rudder is not all the way down the rudder will require alot of effort with the boats tendency to round up into the wind. I keep mine all the way down and have no problem and if I get into shallower water I bring up the rudder and the only time you have interference is when it is all the way up. The C-20 does not rock much side to side. But it does rock a lot front to back. That is why I say an extra long shaft is a must have for a C-20. An I do not have any rudder problm.